If you have some time to kill, brew yourself a hot beverage and sit down to read a long-form travel article on BBC. Read it on your desktop or laptop if possible; the page design is impressive and it just doesn’t look as good on a mobile device. Here’s the link: Gunther, Christine and Otto — How a man met a woman and they set off on an epic journey across six continents in one amazing unbreakable car. The words “epic” and “amazing” are thrown around these days. (What this amazing cat does in this epic video will blow your mind!) But this story is truly extraordinary. The story has a lot of heart. It’s about adventure, human connections, love and all that good stuff. But as I was reading the article, what I paid extra close attention to was the practical stuff. I was intrigued by how they managed to transport the car all over the world, including to North Korea. I also tried to figure out how they paid for their travel expenses. This is what I automatically do now. I try to reverse-engineer how other travelers support themselves financially to see if there are any travel tricks I can learn. When you’re trying to fund your own trip, you only have to figure out three things; all the other stuff is details. And these three things are: how to save up for the trip; how to cut down on travel expenses; and (for extended travel) how to earn some money while traveling. Gunther Holtorf had worked for 30 years at Lufthansa when he first set off on this crazy trip. 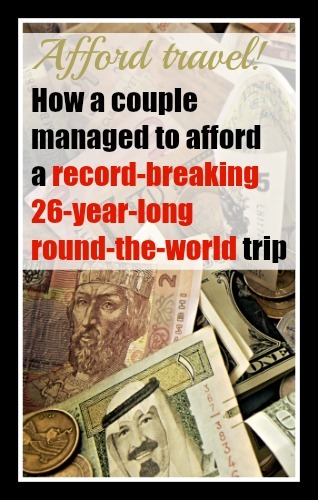 According to this article, Gunther had saved up for the trip until he finally had enough money in 1989. Additionally, remember what I said about people helping this trio continue their trip? Well, Mercedez “had realised as far back as 2004 that Otto was a remarkable advertisement for the G-Wagen, and had paid for the car to be shipped from Australia to Germany for the model’s 25th birthday celebrations.” There were other expenses that Mercedez covered and other doors that Mercedez opened for them. Mercedez wasn’t the only company to have grasped the potential PR power of this story. The insurance company AXA provided Gunther and Christine with “worldwide third-party insurance, a policy that may well have been unique”. All these things combined must’ve made their trip incredibly cheap. Their accommodation cost was zero, their insurance cost — at least for the last few years of the trip — was zero and their food expenses were low because they cooked their own meals. Also, Gunther didn’t bribe officials when he encountered bureaucratic problems. I’m not sure how big of an impact this made on their budget, but it was a seriously long road trip, so these savings would’ve easily added up to quite a big chunk of cash. Gunther and Christine spent the bulk of their money on transport. Traveling with a car posed serious logistical challenges. For example, they had to pay 5,500 euros to get Otto into North Korea and $2,000 to enter Vietnam. Once, they had to spend 2,000 euros to transport Otto off an island on a rusty barge. One big source of income during the trip was a map of Jakarta, Indonesia. Gunther had spent the last three years of his career in the airline industry working in Jakarta and found it difficult to get around because there was no map of the city. So Gunther created a map of Jakarta and published it in 1977. He had continued updating the map up until the early 2000s, when he finally let go of the business, which was facing too much competition at that point. I like learning about the life philosophies of full-time travelers. Having abandoned the conventional model of how life should be lived, these people often have interesting insights. Most people would’ve made time to get married, perhaps putting their travel plans on the back burner. And it’s also possible to have it both ways by getting married while traveling, for example. But this speaks to me about priorities. Most people say they will travel someday and never manage to find the time for it. Gunther and Christine made time for travel and rescheduled everything else. I find myself evaluating the way I spend my time: What do I make time for? What don’t I have time for? Am I spending my time in a way that fits my priorities in life? After Christine’s death, Gunther continued traveling and at one point invited a friend to join him. They had only ever met a couple of times before, but they both seized the opportunity to travel together and had a blast. Gunther may be 77, but he totally gets FOMO and lives his life the YOLO way. Image credit: epSos.de (CC BY 2.0 License). We are only 6 months in to our trip…. 26 years? Incredible! Well, not necessarily. :) All the articles about this couple’s travels are based on interviews with Gunther, so there aren’t too many details about Christine. It’s very possible that she contributed more than the articles imply. And travel expenses tend to get cheaper per person if you travel as a couple vs. as a solo traveler.